Although quilting is known to have existed since ancient times, the art of quilting is uniquely associated with American women throughout U.S. history. 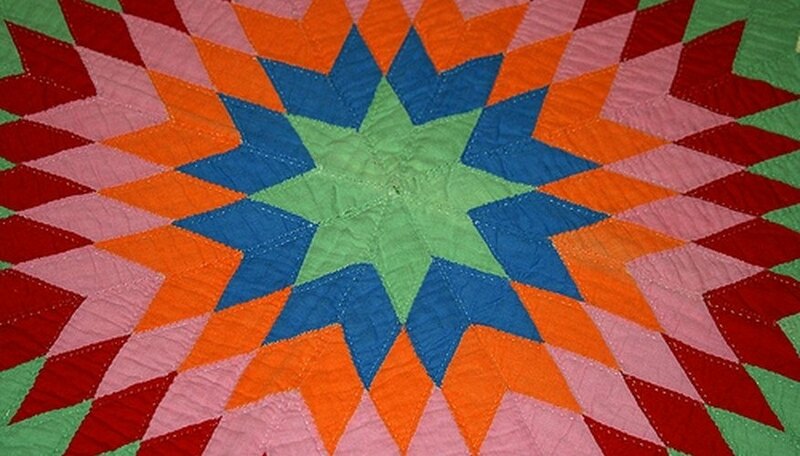 Pioneer-era patchwork was a necessity in a time when new fabric was a scarce commodity. Patterns were no doubt passed from one generation to the next and one woman to the next. As families moved, their environment and circumstances changed, and the naming of quilt patterns reflects these social developments. That is why one quilt pattern can have so many names, and sometimes one name is applied to several different patterns. Not much is known about the earliest quilt patterns. References to quilts can be found in a few old diaries kept by women quilt makers, but there is rarely mention of what the quilts looked like. The first pattern ever printed in a periodical was the Honeycomb or Hexagon pattern, printed in "Godey's Lady's Book" in 1835. At first these early printed patterns mostly had names descriptive of the quilt's shape (i.e., "honeycomb"). The 1880s saw the beginning of regular publication of quilt patterns in women's magazines. As quilt patterns were merchandised, more and more were sold with names attached. The magazines would also invite readers to send in their own family quilt patterns. By 1890, mail-order catalogs included quilt patterns. A woman could order not only fabric from Sears or Montgomery Ward, but for a dime could choose from hundreds of patterns. In the early decades of the 20th century, there was something of a revival in quilting. Dresden Plate, Double Wedding Ring and Grandmother's Flower Garden were all popular during this time. By the 1930s, newspapers were a common source of quilting patterns. Mountain Mist, the batting manufacturer, starting printing patterns right on their packaging. In the 21st century, interest in quilting shows no sign of slowing down. New patterns are being created all the time as people today continue to enjoy creating beauty and expressing their creativity through the art of quilting. It is doubtful that colonial women had much time or opportunity for quilting. The notion of early American women all gathered around a quilt frame at a "quilting bee" is probably romanticized, since most dwelling places would have been far too small for such an activity. Although quilts were doubtless important to the pioneer women, most of a wagon train journey would have been walked, so there was probably little or no quilting done on the trail. While the idea of quilts being used as signals on the Underground Railroad is fascinating, there is no hard evidence of it. Quilt pattern names came from the women who made them. The quilts' names reflected women's homes, family life, the environment, religious beliefs and even political happenings. Quilts relating to pioneer life: Bear's Paw, Log Cabin, Oregon Trail, Prairie Queen. Quilts relating to religion: Rose of Sharon, Star of Bethlehem, Jacob's Ladder, Joseph's Coat. Quilts relating to domestic life: Broken Dishes, Baby Blocks, Cake Stand, Bow Tie, Old Maid's Puzzle, Grandmother's Fan. Quilts relating to nature: Pine Tree, Blazing Star, Maple Leaf. Quilts with patriotic or political themes: President's Wreath, Dolly Madison's Star, Drunkard's Path (popular during the Temperance Movement). 1800---Nine Patch pattern appears. 1806---Irish Chain known, maybe the first use of a block pattern as the overall quilt design. 1810--1830---Log Cabin pattern developed. 1812---Increase of patriotic-themed quilts. 1834--1859---Dresden Plate, Lemoyne Star patterns known. 1870---Crazy Quilt becomes popular. 1890---Double Wedding Ring introduced. 1929--1939---Sunbonnet Sue started.